You probably know that Bloodhounds have an incredible sense of smell. In fact, they have been helping law enforcement track down escaped convicts and missing children for decades! But you may be wondering what to make of the Bloodhound temperament. 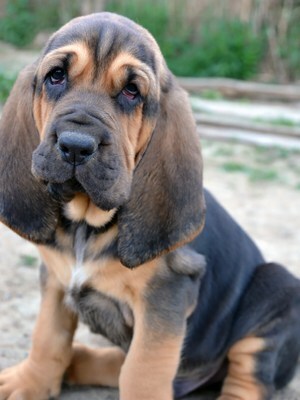 The Bloodhound, a.k.a. the “St. Hubert Hound” or the “Flemish Hound,” is a unique-looking canine with a distinctive baying bark. Many love this dog, and it’s easy to see why. The Even-Tempered Bloodhound Temperament Make Him Great with Kids. The even-tempered and complacent Bloodhound temperament and attitude make him a wonderful family dog. Around children, the Bloodhound will typically lay in quiet acceptance as young children use him as a jungle gym. This type of dog temperament makes him the perfect family pet. Note: No matter how even-tempered a dog may be, it is never a good idea to leave children under the age of six unsupervised with the dog. Bloodhounds are very friendly dogs. They rarely meet a human they don’t immediately love. If you are looking for a guard dog, the Bloodhound is a poor choice. Bloodhounds are loyal but a little too amicable for guard duty. They do, however, make good watchdogs because they certainly have no problem letting you know when a stranger enters your property. Even though they are large, Bloodhounds actually adapt well to apartment living. They do need their daily walks, and they thrive when you give them tracking jobs to stimulate their keen minds. But they are also just as happy to lounge around the house the rest of the time like a dog-shaped throw rug. Bloodhounds are not naturally aggressive toward other animals, and they rarely even show dominance toward other dogs. If you are curious about dog aggression and how to handle it then click here for more information. Bloodhounds belong to the “scent hound” group, and hunters have used them since the 14th century to help them track and hunt prey. The Bloodhound’s large ears help keep the wind from blowing away the scent he is tracking. A Bloodhound’s sense of smell is four times stronger than that of other breeds – and over 300 times stronger than that of a human! Experts have traced the first mention of the Bloodhound in history to writings from the 14th century. Some believe William the Conqueror first brought over the Bloodhound’s ancestors from Normandy, but no one has been able to confirm this. Medieval hunters used Bloodhounds as “limers,” which were dogs controlled on a leash to find deer or boars before pack hounds could get to them. Hunters valued Bloodhounds for their ability to track down a “cold scent,” or the scent of a dead body over a live one. As a result, while Bloodhounds did not get credit for the kill, they still got a piece of the reward from the animal’s carcass. Lifespan: Bloodhounds usually live to be about 10 to 12 years old, but with a good diet and proper care, they can live to be even older. Height: Male Bloodhounds grow to about 26 inches, while females are a few inches smaller at 23-25 inches tall at the withers. Weight: Considered a “Large Breed,” the Bloodhound can weigh between 80 and 110 lbs. While the Bloodhound temperament is generally friendly and easy-going, they can sometimes be a bit stubborn. As with most hounds, they can be independent and determined when it comes to doing their own thing. The best way to make sure your Bloodhound respects you is to always show him calm and consistent leadership. With a plethora of information coming into that powerhouse nose of his, it is very difficult to distract a Bloodhound from a good scent. Nothing Beats a Bloodhound When It Comes to Stamina! Once a Bloodhound picks up a scent, he will dedicate himself to following it. 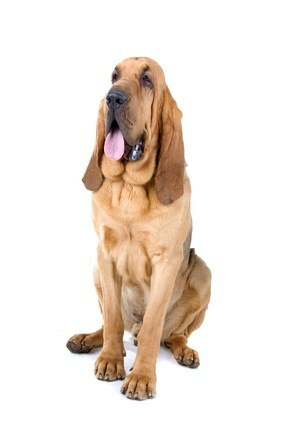 In fact, it’s not unheard of for Bloodhounds to follow their noses for up to a hundred miles! Because of this, it is a good idea to always have your hound on a leash when outside of a fenced area. For help with training your Bloodhound, you should take a look at The Online Dog Trainer by Doggy Dan. Doggy Dan is an expert Dog Trainer based in New Zealand. His online resource contains Hundreds of Excellent Dog Training Videos that will take you step-by-step through the process of developing a healthy, happy well-behaved dog. Obesity– Because of their mellow temperament and love of food, Bloodhounds are prone to obesity and the health risks that come with it. Ear Infections– Those long, floppy ears are the perfect place for infections to thrive. Left untreated, ear infections can lead to ear hematomas, and so you should always deal with them as soon as you find them. Skin Problems– Due to their loose skin, Bloodhounds can often suffer from skin problems. You can avoid these with regular grooming sessions and a quality diet. Droopy Eyes– Believe it or not, the Bloodhound’s classic droopy eye can actually cause him a lot of problems, conjunctivitis being the most common of them. Note: Our Health is #1 Priority. It should be no different for your Bloodhound. But you need to help him. The Ultimate Guide to Dog Health is the answer. This handy guide will help you recognize the symptoms of the health problems above. Get the knowledge to stay ahead of these terrible issues that can rob your lovely Affe from vigor and life. Help your friend make it to 14 yrs+ without pain and suffering. Bloodhounds shed about once or twice a year. Brush him weekly to keep your house clear of the dead hair. Brushing the hair also encourages it to grow and distributes his skin oils more evenly, giving his coat a natural shine. Bathe him regularly to keep him from getting stinky and be sure to trim his nails regularly too. As far as Bloodhound colors go, there aren’t too many to choose from. Basically, you have red, liver and tan, and black tan. A Daily Dose of Exercise Can Be a Cure-All! As with most dogs, Bloodhounds respond well to a long daily walk. A hike or a game of hide-and-seek will go a long way in keeping your Bloodhound manageable and happy. Bloodhounds are active dogs and, as such, they require regular daily exercise. Long walks are perfect, though no matter how well-trained he is, you will still want to use a leash. This is because if he gets one good whiff of potential prey, he’s outta there! You can also exercise him in your backyard, so long as you keep him fenced in. Make sure the fence is secure, though, because Bloodhounds are diggers and can dig a hole underneath to escape. If you think you would like to add a Bloodhound puppy to your family, you may not know for sure whether you’d prefer to buy or adopt. After all, you may be thinking, what’s the difference? Whether you choose to buy a Bloodhound for sale from a breeder or adopt one from a rescue or adoption agency, it’s important to be careful in who and how you choose. The average Bloodhound price can be anywhere from $1,400 to $5,500, depending on the dog’s bloodline and the price the breeder decides to charge. Adopting a Bloodhound is way cheaper, but if money is that much of an issue for you, then you may want to wait on getting a dog, whether you buy one or adopt. The reason for this is that even if you can come up with the purchase price or adoption fee, you still have to budget for additional, regular expenses, like dog food, treats, and vet visits. And, of course, there’s always the issue of whether your dog becomes sick later on and requires routine care. No one can predict this, of course, especially in a dog that otherwise appeared healthy. That’s why it’s a smart idea to put money aside in the event of an emergency. If you want to adopt a Bloodhound puppy, you may be able to find one at your local animal shelter. You may be wondering, why adopt when I can just buy a brand-new puppy? There are actually a number of benefits to adopting a dog. Aside from the lower price of adoption versus buying from a breeder, when you adopt you also get to give a home to an animal who might otherwise have never found one. Plenty of dogs wait in shelters every day, hoping someone will adopt them. Others finally find their “fur-ever homes” years after they enter the shelter – and it’s always worse for older dogs. Plus, with an older dog, you don’t have to worry about waiting for them to outgrow the chewing phase or learn how to housetrain. Older dogs have grown out of the teething stage, and if their former owners didn’t housetrain them, then the shelter will. The shelter doesn’t want to see their dogs stick around either. They try to do everything they can to make the dog as appealing for adoption as possible so they can free up a cell and help another dog who might otherwise be living on the street. If you would rather purchase a puppy from a Bloodhound breeder, you may want to look into the website for The Bloodhound Club of America. Official websites are great resources because it is less likely the website would put their name behind a breeder if the breeder was disreputable. Bottom line: you’re spending a lot of money with a breeder, so when you select one, you want to feel confident that you have done all the research you could and learned everything you should know about that person before signing that check. A great way to do this may sound simple, but a lot of people don’t think of it right away: Google the breeder. Odds are, if someone had an unpleasant experience with that breeder, you can read all about it online. When you choose your breeder, do your due diligence when you drive over to meet your potential new best friend. Scope out the premises for anything sketchy. Is it dirty or unsafe? How are the dogs acting in general? Does the breeder seem like the type to curb aggressive behavior right away, or let it stand? Make sure you get every piece of documentation regarding the puppy you choose and don’t be afraid to ask questions. A good breeder will still be there for you long after you’ve adopted one of her dogs. If you don’t mind a lot of drool and can be patient yet consistent with your training, this might be the right dog for you. The easy-going nature of the Bloodhound’s temperament can make him a wonderful companion and with his superior sense of smell means you’ll never get lost in the woods!